I am so excited to start a new series on the blog today. While titled 'Freshman 15', this 15 is not the dreaded kind. Over the course of the summer, I am planning to write 15 posts geared toward incoming college freshmen. Speaking from my own personal experiences over the past year, my hope is that by sharing some of my tips that you may find them useful as you begin your college experience! At this point in the process, your freshman deposit is secure, you may have chosen your housing and roommate(s), and this summer is all about preparing for the upcoming school year. So to begin the series, let's start with one key part of the freshman experience before classes even begin — orientation. My orientation dates were just a week after my high school graduation, and I was excited to get the ball rolling so soon on this new experience. I really didn't know what to expect at orientation, but it left me walking away both excited and ready to start my college journey. While orientation differs at each school, you will likely select your first semester classes and learn about school programs and services. So although your experience may not be identical, I hope you find this post helpful! First for a little background, here's a brief description of my orientation. 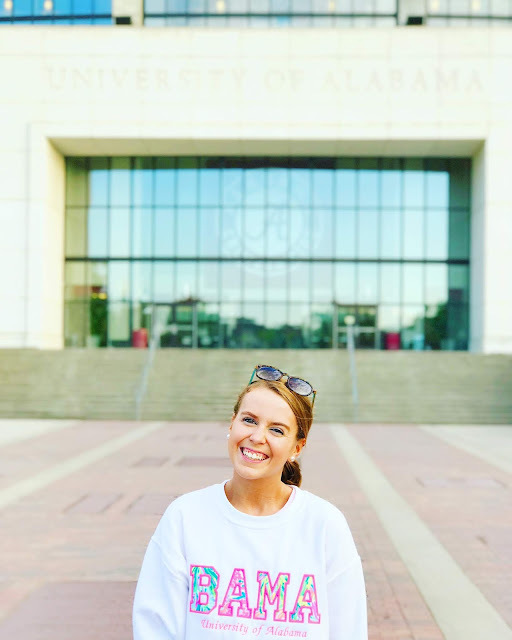 At the University of Alabama, orientation took place over the course of a day and a half. On the first day, the initial program was with all the students at the orientation session. The orientation student leaders were introduced and a few of the student services departments spoke, congratulating us on our college choice and welcoming us to campus. Afterward, we split up into our respective colleges based on majors. I then learned about what life would be like as a first year business student, the classes available for a student at the introduction level, and later the academic advisors spoke to us individually about what classes we should take in the fall. At night we had an open gym event at the student rec center. The following morning was spent choosing and registering for our classes for the fall. It is, after all, orientation — you are not expected to understand the school system or registration process, and it is definitely not high school. When making our decisions about classes and our freshman year course load, UA had a plethora of staff and student advisors that were ready to help in any way that they could from understanding prerequisites to how far a walk it was between buildings. I would highly recommend utilizing these individuals in your decision making process. Before I went to orientation, I curated a list of questions regarding my AP credits, UA's placement tests, and other factors that would influence my course load. When it came time to speak one-on-one with an academic advisor, this was really helpful and made it possible for me to make the most out of my conversation. I also suggest obtaining a phone number or email of an academic advisor that you could reach out to throughout the summer as well. You may not have any questions or need to contact them, but it's so much easier to have a direct contact just in case. Know that plans can change. I remember being so nervous that the classes I chose were set in stone and the schedule decisions I made that second day would determine the rest of my college career. But changes do happen. Little did I know I would be changing half of my schedule two weeks into the school year. I discovered a placement test I could take to move up a level in a course. I took the test in the summer and qualified to move up. Changing one course, however, impacted three others which required dropping and adding half my original schedule. So even if you like your schedule, listen when they describe the add/drop process and make sure you know the deadlines. Just keep in mind that everything can still change after orientation so don't worry about it too much in the moment. Oh, and avoid 8 a.m. classes if possible! Everyone at orientation is in the same position: most really don't know anyone else there or just know a couple people, and no one wants to be alone. In this mass of new students, take orientation as an opportunity to make friends with people in your group. The girls who I ate lunch with at orientation are girls I see all the time on campus. Sure, you probably won't find your best friend at orientation, but by being open-minded you can learn from students around you and begin to find familiar faces you will probably see on campus again. Take everything with a grain of salt. While it was helpful to learn about what some of my future classmates had done to prepare for the upcoming school year, everyone is in the same boat of uncertainty and has a different approach. At my orientation, a large subject amongst the girls was sorority recruitment. I remember standing in line for lunch and girls telling rumors they'd heard about certain houses and talking about recruitment. While some information such as deadlines may be helpful, other information could be false. Try not to let these rumors or debatable topics distract you out while at orientation. The student orientation leaders are going to provide much more solid advice than other incoming freshmen. I hope that this post was helpful and that your orientation is productive and exciting! Have you been to orientation before? If so, what would your pieces of advice be to an incoming freshman?